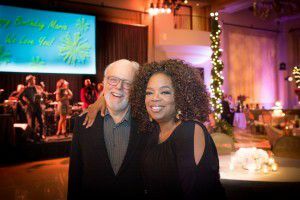 Besides the fact that the room at the Montage Beverly Hills was indeed gorgeous, Oprah had further reason to be pleasantly surprised. Only hours before, the ballroom was filled with hundreds of business people attending a seminar. 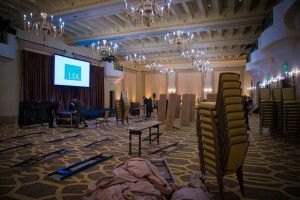 It might have seemed impossible to Oprah that the room could be transformed from zero to fabulous in less than two hours. 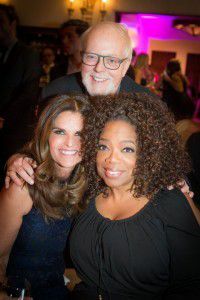 But then, while Shriver was very familiar with what her friend and go-to event producer could do, this was the first time Oprah had co-hosted an event with Bendix and worked with his team at Carl Bendix Productions. 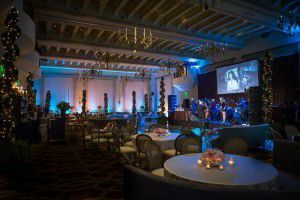 Just the night before, that same team had produced an event for 1,000 people at the Beverly Hills Hotel for the Friends of the Israeli Defense Fund. With two high-profile back-to-back events, there was no room for error. When the business seminar had cleared out and it was “go-time” at the Montage, they were ready. because we are on time with everything! 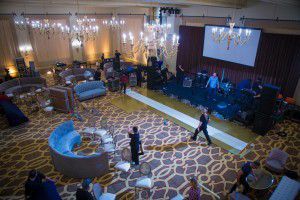 Four trucks had been waiting at the loading docks packed with the necessary staging, audio-visual equipment, plush club furniture and floral arrangements to transform the space and the foyer into a party for Shriver and 180 friends and family. Such a beautiful guest sign in area. 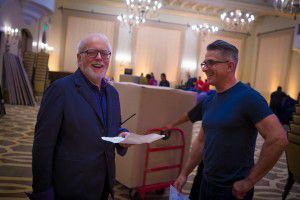 By the time Oprah entered the ballroom (as host of the event she arrived well beforeShriver), the hundreds of hot pink peonies and roses from Eric Buterbaugh Floral Design and Flowers in Beverly Hills were opening up perfectly. 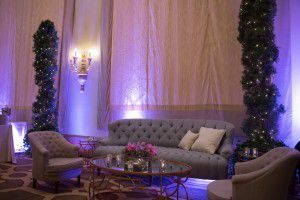 The greenery around the room was set and decked with bistro lights to bring an old-world elegance to the setting and intimate seating arrangements featuring plush clubby furniture from Revelry Event Designers was placed just so. The house lights went down, the magic came on and the guests began arriving. The club came together fast with lighting, floral and greenery.Ready for doors to open. After cocktails in the foyer, the doors opened and guests spilled into the ballroom-turned-club complete with a rocking house band. 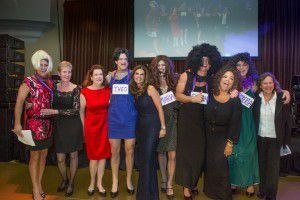 Shortly thereafter, actor Rob Lowe introduced the evening’s speeches followed by a good-natured “roast” song about Shriver custom-written and performed by several of her brothers and sons dressed in drag to represent both Shriver and her best friends. Finally, the co-hosts, Oprah, Sheryl Lowe and Bendix came on stage to offer heartfelt words of admiration for their long-time friend. Bendix had chosen just the right metaphor for a 60th birthday celebration in which each candle on the cake truly represented another year in a warm, inspirational and well-lived life. A feeling that was celebrated again in song as Stevie Wonder took the stage to sing songs from the key of life, including, of course, Happy Birthday! A hilarious family skit about Maria and her friends. The hosts and the birthday girl celebrating.